The construction industry is constantly improved. And if earlier for the construction of buildings used stone, now special popularity of prefabricated structures, the construction of which use lightweight durable and dense material, for example, steel. And the most common building elements are metal girders. Select the static scheme of the farms and determine the outline of the belts of this design. The choice of one or other of the outlines of the farms due to the appointment structure, roof type and angle of slope and other factors. As a rule, for buildings of civil and industrial purpose used split farm trapezoidal shape with parallel chords. Determine the General size of farms. Provided that the technological requirements not foreseen something else, the length of the trusses is prescribed so that the total cost of the trusses and supports were minimal. In other words, the appointment of the General sizes rely on economic considerations. When determining the height of trusses consider the following parameters: material used for roof coating, transport of construction, minimum weight and the ability to provide a specified angle of slope of the belts. Calculate construction hoist, that is reverse camber, which is under strong load is paid off - farm accepted the design position. Construction hoist is calculated in metal trusses with a span of more than 36 meters and the farms of high-strength steel and aluminum alloys. Determine the dimensions of the panel: they should correspond to the distance between the elements, which transfer loads to the metal structure. Remember: the panel dimensions must meet the angle brace. For different girder angle of the bracing may be different. For example, if the lattice is triangular, the angle of the brace is 45°, and at a diagonal - 35°. When calculating a farms the distance between their nodes (assuming that the coating is made from metal panels or the huge concrete slabs, specify equal to the width of the panel or cover on the run) step run. All calculations need very carefully! In order to avoid errors during construction will help to an experienced specialist who will indicate the available calculations of error and help to fix them. 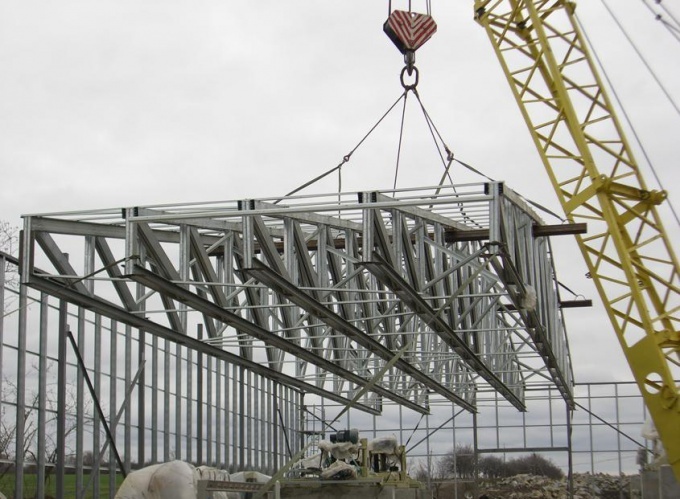 To avoid lengthy and tedious calculations of the farms, can take advantage of existing standard designs trusses used in industrial buildings and public buildings.